New version of the OSMPBeehive is just about ready for “primetime”, I am dubbing it 0.2 as it’s still just me getting whats in my head down in 3d without figuring out exact numbers (not parametric yet, sorry!). Looking more at Makerslide, I think that’s our support material – MakerSlide is an aluminum V rail integrated into a standard extrusion profile. 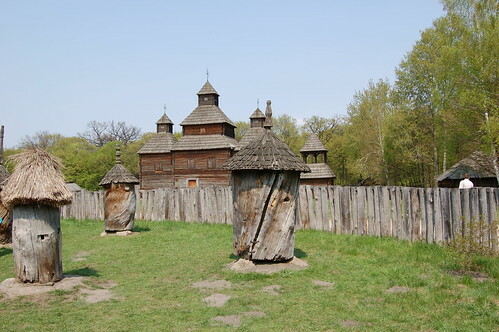 An installation would be two 4′-7′ legnths set 2′ or so in the ground, with the wheel grooves on both facing inward. Those seem pretty ideal for the type of ratcheting “insert Clean unit in the bottom, remove Full unit out the top” system I mentioned in the brainstorm post. Without further adue, here she is! I call it the Hivestack, the bottom unit is suspended off the ground and the bottom holes would be covered by strong wire mesh. The central nesting shaft is now gone, and the comb-templates create a sort-of library feeling with narrow corridors between the frames. I was able to increase the number of full-size frames to 6 with this configuration. The floor plate which was previously a seperate piece is now integrated into the body, each unit will nest on top of the next with little or no gap. There are still entrance holes on all four sides, but only one row per module now (two rows was a bit silly) – Also, I’ve angled the round entrance holes up at a 45 degree angle to make them easier to defend and to keep out rain. Since we got rid of the “floor” piece, that means the top unit needs a roof of some kind to keep out the weather. I havn’t put much thought into it, but when my wife saw it she said it looked like a little elf house made from a tree. Me? I’m just subconsciously emulating the Ukranians. Any ideas or clever things we should build into it? I didn’t worry about removing the combs individually: Modular design allows the top unit on the stack to be harvested as one piece! Since each unit is small, in the next version we could dispense with formal “frames” and just print some kind of lattice matrix that would let the bees build comb in whatever way was easiest. Simply use a centrifuge to extract the honey from the module, then toss it in a large pot of boiling water to remove the wax from the module and sterilize it (this also recovers the wax, but not the comb). That seems like a pretty slick and sanitary workflow to me. With a conventional hive, do you sterilize the inside & outside walls every harvest? I could even see doing this over the course of several days to minimize the stress, where you remove the top unit, then add one clean unit to the bottom of the stack each day until your harvest is complete. Its illegal. Every state requires all the frames to be removeable. Doesn matter if belive they need to be or not its the law. Version 0.2 needs to have all moveable frames if you want to even discuss the merits or flaws of this design over the current standards. And I very much do want to discuss it here, but I’m curious if others think this will be a problem? Seems like this design probably fits the letter and spirit of the law, but I’d like a second (3rd…4th…etc) opinion, please chime in! Size and ratio will be important once someone starts drawing this up in parametric fashion – bees seem to use how big a hole is relative to their body size to determine how to respond to a breach in the hive. Whenever this gets to real CAD software, all transit spaces will need to be fixed…. Anybody have experiance with this? Can we scale part of a design, but not all of it while still tracking where the fixed diameter features are on the overall model (if that makes sense)? 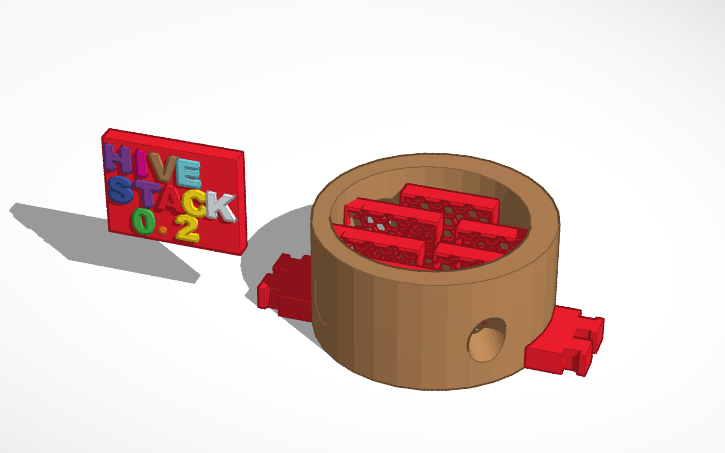 My “render” times on tinkercad have gotten into the 10 minute range, and breaks altogether with more than 4 modules so I think this is the last version I can build there. 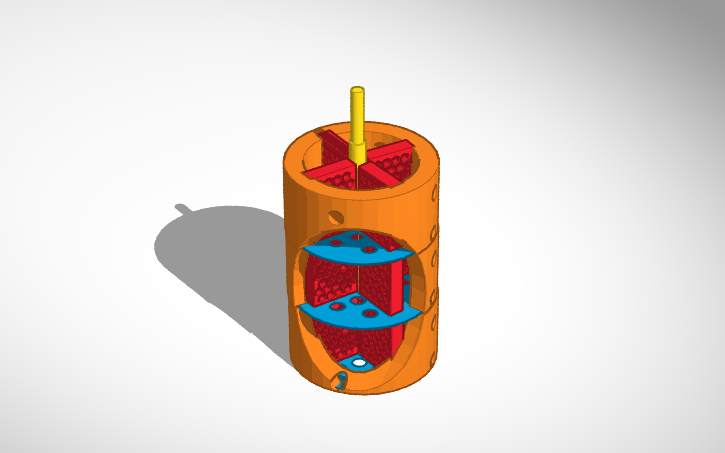 The next step is to transition to more capable CAD software, and create the 1.0 iteration. Anybody want to take the first shot at Hivestack 1 plans? Any suggestions to topics I did or didn’t address here? Thanks to everyone who has participated so far, if seeing what I’m doing is giving you ideas please share them! Edit: The Bee Project is featured on Thingiverse! 24 hours in, and I can’t help myself but put some thoughts up before heading outside for the day – I’ve been reading up on bees at the very informative beekeeping.com and have come up with a few ideas I’d like feedback on. Bees in nature work with gravity. Given the natural space of, say, a hollow tree they will start at the top and draw the comb down. This realization has been fully incorporated into the design of the Hapiary hive. The hives are installed with all of the pods in place from the beginning. True to this initial observation, the bees start drawing comb from the top of the hive. This allows the Queen to always follow the cleanest, newest comb as it descends within the hive. So that gave me an idea. Right now, the mechanism to attach the modular beehive units to each other is by a nesting shaft located centrally, but that has a big problem. It means that in order for us to remove any one or several sections, we have to totally disrupt ALL the units above it, which need to somehow be supported and lifted… Frankly speaking, it’s just not going to work. We know the hive will be filled in from the top to the bottom as expansion needs manifest, so it makes sense to start with a full size unit – What about using a self-supporting frame out of a material like Makerslide, then designing the modules to be removed from the top and loaded in from the bottom (probably some kind of ratcheting mechanism). You start the hive, the bees work their way down, and once they have the structure 75%+ full, you remove the top 50% of the modules entirely for honey retrieval and cleaning. Then you load fresh units in from the bottom so the hive has clean expansion space again, while still having enough energy from the remaining 25% undisturbed but full-of-honey modules. You could build the unit on a scale, and after the first collection you could use weight as a criteria for knowing when to check the hives for expansion needs. I will mock this up when I have time, if you’d like to help and know how to 3d model I encourage you to take a swipe at it! I always thought you needed the smoke to convince the bees to leave, but watching an episode of a “how the natives survive” show recently, I saw how some african cultures that collect wild honey just gently blow on the bees, which is enough to make them peacefully evacuate. They were wearing no protective gear, group of about 7 people (plus whatever cameramen) huddled around a hollowed tree and there were maybe two stings suffered. So, obviously smoke isn’t required. Looking more into this, I came across some… creative… mechanics for removing bees. Hi Dan, I just use a leaf blower and operate it at about half speed. You will get the hang of it after a while. I just set the super up on it’s side in the hives lid. Work on one side then the other and back to the first side and do this over again till they are out. Then I take the super away and put the lid back on the hive. It’s not a bad idea, but the restrictions of convention beehive design & manufacturing make this way more disruptive than it needs to be. Since this project is based around additive manufacturing (3d printing in its various forms), we have all the advantages previously mentioned – Among them, Complexity is free! Why not build each modules walls with a “bee suppression system” that allows you to plug a can of compressed air (or similar) into the side of a given module, and have the hive be flooded with low level disruptive but not debilitating, irritating but not dangerous downward biased crosswinds that strongly encourage the bees to lower levels? Obviously this would need some tuning, but the goal would be to start at the top and herd the bees into the lower levels, allowing for removal of the upper stories with no bee removal. This could be as detailed and intricate as is helpful while actually reducing manufacturing costs. I think when I test that, I’ll wear two bee suits. Bees are a big deal. Einstein once said without bees, civilization would collapse within 5 years due to lack of pollination. Personally, I don’t believe any of that, but I think bees are cool as heck and just learned about how Bee-Hives are pretty poorly designed due to constraints on construction. The little bees require detail that is a bit too fine to be affordable, Until now! Each section holds 8 frames, 4 of which are removable and 4 of which are structurally part of the housing. As a bee-keeper, you want to make sure to not take too much of the bees honey because it is their food as well as delicious, thus no need to remove the “larder” frames. Three units assembled, with cutaway. Wow! They make a substance that acts as a structurally adhesive filler with anti-viral/bacterial properties! How do we get them to make more of that than they do in conventional designs? Well, Hex-hives has solved that one too – They use rough finish on the inside of their wood boxes, which creates an irregular surface the bees are compelled to smooth out…. By covering it with this material! So that means we either need to print a rough textured surface, or do some post-processing to rough it up. The design incorporates multiple round transit holes which are easy for the bees the sanitize and guard, the central shaft running through the unit is recessed for the bottom portion, and designed to have the top of one unit nest deeply into the bottom of the next for stability. The bottom unit of the hivestack should have a solid wire mesh attached to the bottom of the unit to keep out nosey things. Some additional notes on efficiency with bees: All areas of comb should be quickly accessible, lots of existing designs rely on bees all coming in on one level of a hive, and then they basically climb around the internal structure until they get where they need to drop off the pollen/nectar. Since this design is round and relatively small diameter, the frequent perimeter holes let bees land wherever they are needed, drop off and head out again. This unit is designed to be mounted on or in a tree, and thicker walls are probably better than thinner. The outer wall provides insulation for bees during hot and cold, so if you have any knowledge on materials that might be well suited for this application, I’d appreciate the input. I’m new to additive manufacturing with my first (printrbot) coming with the kickstarter release this month, is there a reason PLA and ABS are used to the exclusion of other materials? Or is it just availability? 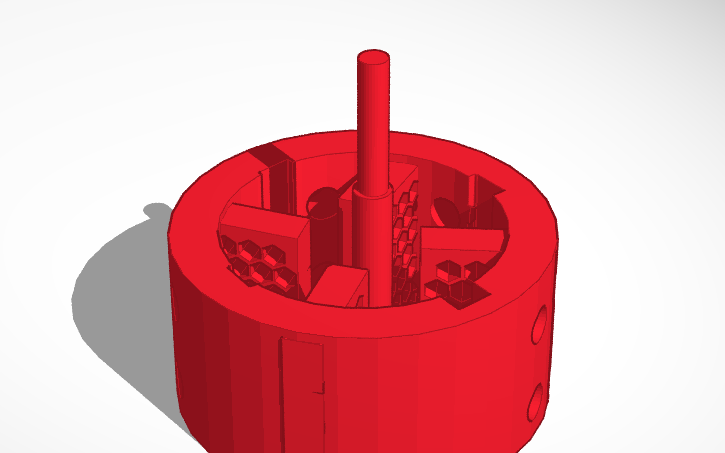 This is version 0.1 of my modular beehive design. 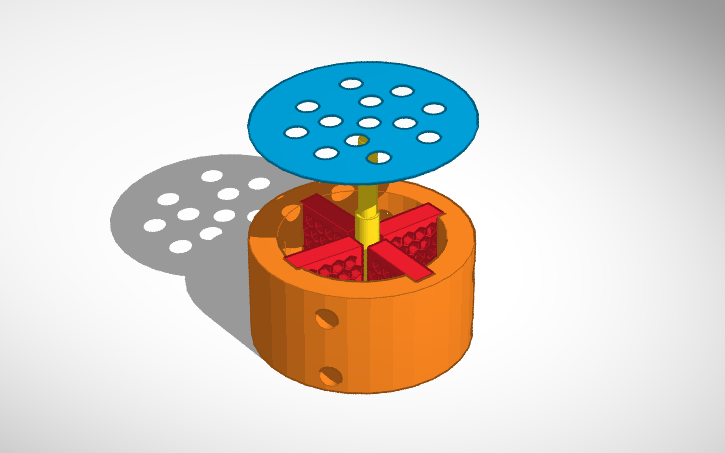 I’m very new to 3d modeling and built this in Tinkercad just eyeballing the dimensions so I could convey what I have in mind, I invite anyone else interested to take the concept and run with it, I look forward to your suggestions and contributions. Some immediate improvements I’m looking to develop include changing the removable frame mechanism from the current system (vertically inserted into the cut-out holder from the top of the unit) to one where you pull the frame out the side. Currently, to get at any honey you’d have to disrupt any units above so that obviously could use a re-think. I’m not sure what scale this should be, but the one I’m using is probably wrong. 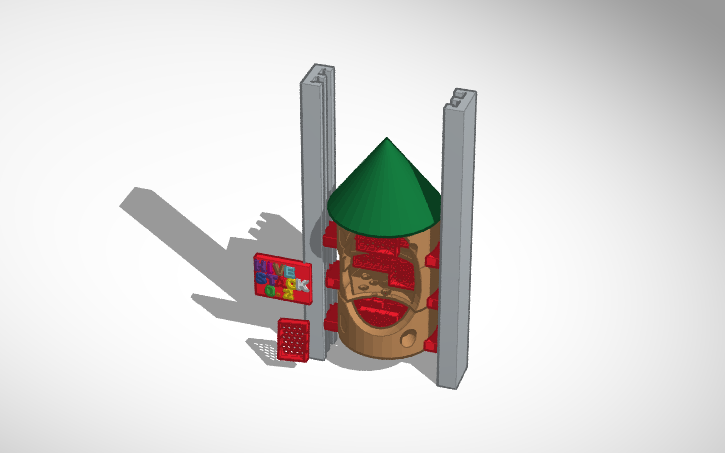 Obviously this is too big for Tinkercad, any suggestions?